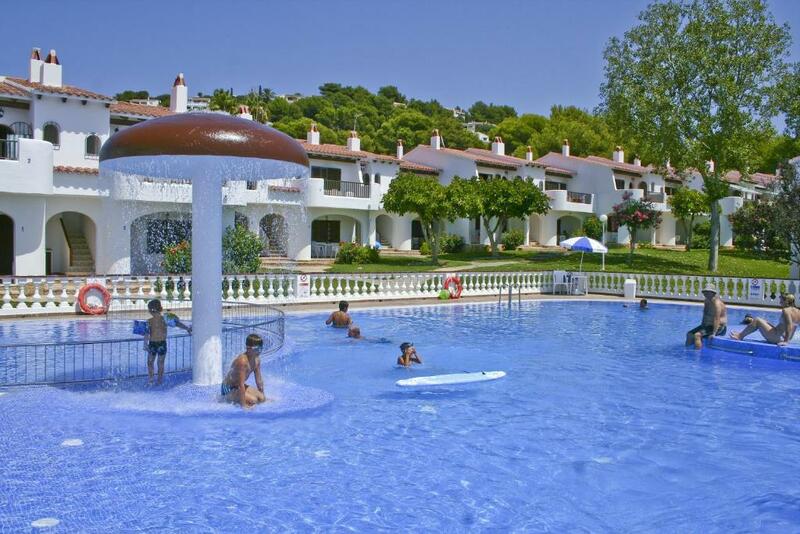 We asked for an apartment close to the pool and we received it exactly facing the entrance of the pool so it was great to watch our children playing in the pool while I was cooking in the kitchen. Possibility of taking shower after check-out before our departure to the airport was very comfortable, too. Location was great and they sorted the ground floor we requested thanks for that . The location is good. Beach close to the apartments. Quiet place, good to stay with children. Great place for a week or more! The apartment was very huge, with 2 bedrooms, large bathroom. 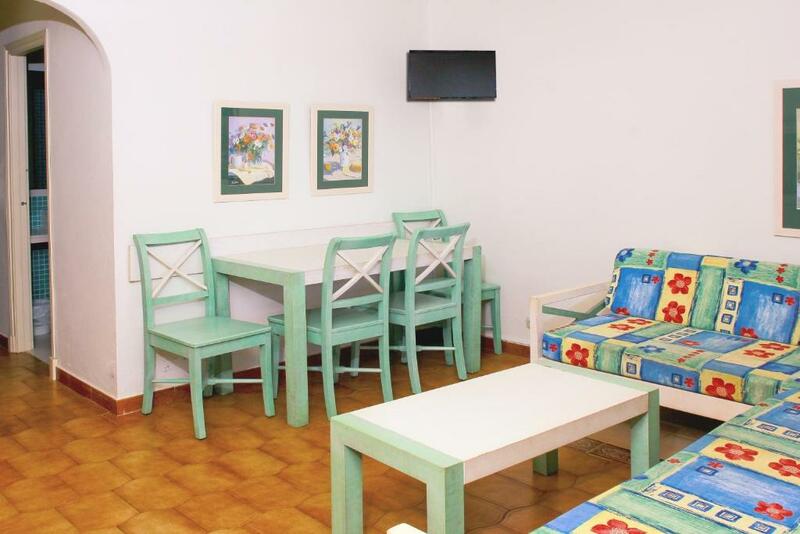 Very great that there is a fully equipped kitchen with oven, microwave water heater and etc. There is a large living room, as well. The area is clean, and quiet. Supermarket, bakery and surgery are only a few step distance. It is next to Son Bou beach witch is one of the rare by car accessible beaches and it is very large and suitable for families and children, too. The staff was very friendly, and contactable all day, thank you for the nice welcome and the helping hand. Thank you for the bottle of the water in the fridge! :) Son Bou's location is great to discover the Island, because it is in the middle of Menorca. Rooms were big and clean with everything we needed. Ceiling fans in every room which really helped as no aircon. Safe boxes were in reception area which we actually preferred as felt safer with someone watching over them. Staff were helpful and friendly. Check out was at 10am but there is facilities for storing cases and showering etc which we made use of on last day. Location. great beach within easy walking distance. Apartments are a little tired but adequate for a weeks stay. Community grounds and swimming pool in first class condition. Internet not great in apartments but ok near the pool and restaurant area. Apartamentos Son Bou Gardens This rating is a reflection of how the property compares to the industry standard when it comes to price, facilities and services available. It's based on a self-evaluation by the property. Use this rating to help choose your stay! 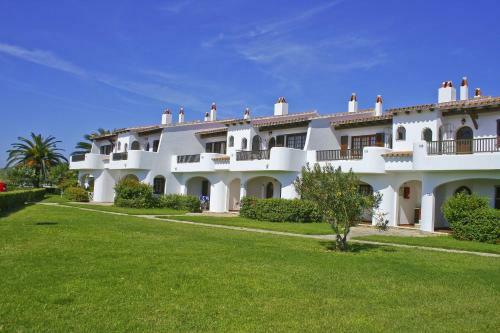 One of our top picks in Son Bou.These idyllic apartments are surrounded by lush Mediterranean grounds and outdoor swimming pools – the perfect venue for a relaxing break on the beautiful island of Menorca. The Son Bou apartments have been built in the charming, traditional style of the Balearic Islands. Set facing the south, each one opens onto a sunny private terrace ideal for sunbathing. Inside, each apartment is decorated in a homey, local way, and features a kitchen unit. Take the half-mile walk to Son Bou beach to enjoy the golden sands and clear Mediterranean waters. The town, with its stores, bars and restaurants, is also just a short stroll from the apartments. Dine at one of the many great seafood restaurants, or at the 2 restaurants found within the apartment complex. 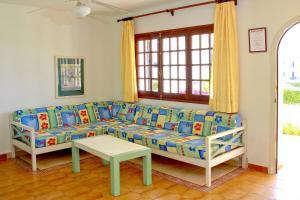 When would you like to stay at Apartamentos Son Bou Gardens? This apartment features 2 twin bedrooms with wardrobes and a lounge with sofas. There is a balcony, and the kitchen includes a microwave. Los apartamentos Son Bou Gardens se encuentran situados en la parte baja de San Jaime y muy cerca de la playa de Son Bou. House Rules Apartamentos Son Bou Gardens takes special requests – add in the next step! Euro 6000 Apartamentos Son Bou Gardens accepts these cards and reserves the right to temporarily hold an amount prior to arrival. Apartamentos Son Bou Gardens accepts these cards and reserves the right to temporarily hold an amount prior to arrival. Total payment is realized at check-in by cash or credit card. A desposit, payable by credit card must be put down at check-in. This will be fully refunded once the condition of the apartment has been approved. Please note that apartments are cleaned and towels are changed once a week. Bed linen is changed after 8 nights' stay. Please inform Apartamentos Son Bou Gardens of your expected arrival time in advance. You can use the Special Requests box when booking, or contact the property directly using the contact details in your confirmation. The appartement at arrival was not cleaned enough. Lot of sand and dust on the floor. We were with a little baby moving on the floor, so not good situation. No sponge or soap for dishwashing is provided. Not enough items in the kitchen, and pans with bad state. Doors in the apartment are really old and not all possible to close. In general the apartment interior is old and need a refresh. For a place recommended for families and children, we would expect chairs for children and baby bed provided without extra costs, but unfortunately these are charged daily. Oldish property but clean and well maintained. It is a good place, so I recommend to choose it. But there are SMALL(!!!) things which can be improved: Mattresses are moving on the bed, no salt and pepper, sponge and dish detergent. I think every traveler leaves something there but they put it in the garbage - I don't know - perhaps it is their policy, but these small things were great. One window was not well lockable. (But the area was very safe.) These small things could make my stay better. They will only provide one toilet roll per stay, we were told to buy our own when we asked for another. Towels only changed once in a whole week, which wasnt great. Cooking facilities look good but when we tried to use oven we discovered the oven runs off a gas bottle which we found difficult to use, no lighter provided, and felt quite risky (had to get maintenance out) not great as an oven just as a grill. We had to pay for the hairdryer & the key to the safe, neither of which I have had to do when I’ve stayed at the apartments before. Bin men arrive early! Some neighbours can be noisy because all the windows tend to be opened in the height of the summer - but hey, if you're tired you can sleep on the beach! the apartments look so lovely from the outside but the insides are very dated could do with updating but overall excellent value for money. Minor hiccup for us but the wifi connection didn't cover our apartment. We were warned at the check-in it might happen which didn't help the situation though. The property was cute, clean, very well maintained and close to a gorgeous beach and city center, without being busy and loud. Perfect for chilled out holidays by the sea! Smelly, dirty etc. No holiday. Excellent for the children & safe. Apartment a little dated but clean and comfortable. Apartment was situated in Zone 5 which was ideal for us. Bus stop a few metres away, as was Reception and luggage storage facility. A level 15 mins stroll to the beach, bakery mid way ideal for a coffee stop! Grounds that the apartments are set in are well tended with lots of flowers and trees, a beautiful setting for a relaxing holiday. The value for money and the location!